The Royole Moon is like having a movie theater right in front of your eyes without renting a huge space. It's an audio/video hybrid that can play both 2D and 3D VR content - and also has great sound. Well, it better be with Akon being the CCO (Chief Creative Officer) of the company. The unit looks like an imposing piece of future tech, something most people would do a double take on. Like a time before Bluetooth headsets were the norm as far as smartphone accessories were concerned - people would stare as if you'd just escaped from a mental institution and watch you talk to nobody in particular. It took some years before general acceptance, and I reckon it's a similar situation with the Royole Moon. There's a lot of technology involved to cover both visual and audio entertainment together. If you can imagine trying to cram all the elements of a movie theater into something portable, you'd think it couldn't be done for a total of only $800. Not at this level of high quality. The audio is quite good, especially with the Active noise cancelling to 22dB. This makes it a good option for air travel, which should help defeat the jet engine and baby crying noise. In fact, I really couldn't hear very much of anything with the headphones on - and they weren't even turned on! And I quite enjoyed the audio quality, especially in a bout of gaming on my PS3. Not only was the music a joy to listen to, I could make out footsteps of my enemies and the direction they were coming from with high accuracy. You can play back music as well as video; I was easily able to connect my hard drive to the Moon to listen to my MP3 collection in high quality without having to download anything. Nobody likes to read user manuals, but in this instance it's the only way to know how to control things since there are only a few buttons. The good folks at Royole must've realized this because they have the quick version printed on the box - if you didn't read it, you'd be lost. It's a sleek, touch sensitive control that they built right into the right earcup. Tap once to accept, twice to go back, and swipe left/right/up/down for directional control. The volume is built into the circumference of the same earcup, going clockwise/counter-clockwise to raise and lower it. It's a really good idea because the reality is, your eyes are covered up and the last thing you want to do is hunt around for a remote, mouse, or keyboard after you've made all the adjustments to make this thing fit. On that note, there's a lot of cushioning provided all around. Both ear cups are padded, as well as the whole area around the face. The good news is, you won't have any marks when you take it off. The headset attaches to a "black box", which is the brain running on the Android operating system. It comes with 32GB of space built in so you can copy over your own video and music files, but it also offers several dongles for input. You can connect via HDMI, for example to laptops, game consoles and bluray players (though you do have to provide your own HDMI cable). 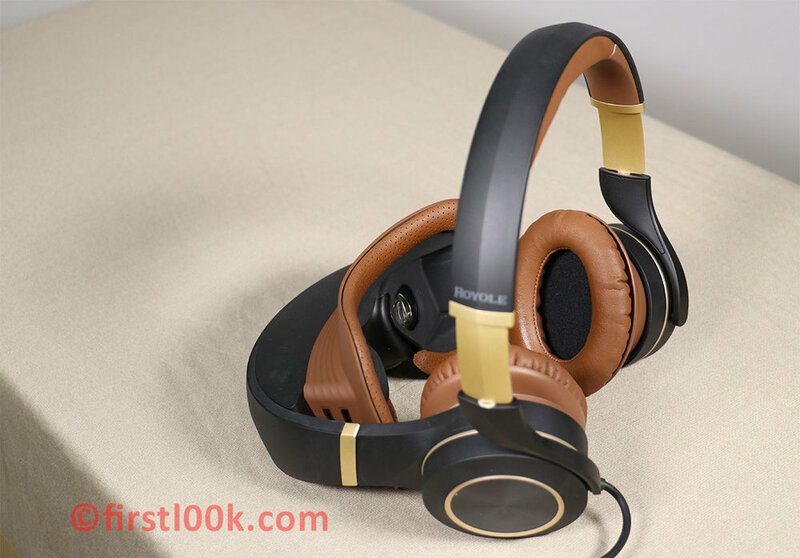 If you want, you can also connect to flash drives and hard drives via USB and use the built-in controls in the Royole Moon for playback (you need to provide the USB cable too - the Royole comes with an OTG dongle which accepts USB Type-A cables.) It also serves as the battery, with a usage life of up to 5 hours of use per charge. The Moon can connect via wifi and has a YouTube option built in as well as a direct multi screen cast. YouTube I can understand - you stream content to watch on the Moon via a normal wifi connection to the internet. Multi screen casting I understand less of. Does it mean you can cast what's showing on the Moon to another screen? Or cast content from another source directly to the Moon's screen? It's a direct one to one wireless connection, so you shouldn't need a wifi router or hub (I presume some kind of DLNA). For me, after failed attempts to connect to a smart tv, several laptops and smartphones, I unfortunately cannot comment on how this works. But it sounds like a great idea in theory if you can figure it out. There are several considerations I suggest you take into account before buying this product. I happen to have a thin body type, and this includes my neck. If you don't have strong neck muscles (meaning if you spend all day in front of a computer and do little exercise), you may have some issues having this on your head for too long. I've found myself having to support the visor section with my hands for periods at a time, so even with a five hour battery life, you won't last a full five hours without some help. The situation changes when you're playing a game. Since you have a controller in your hands, you can no longer support the visor. Personally, I found that tilting my head upwards helped a lot to balance out some of the weight. On the other hand, you could think of it as a workout - your neck muscles would be getting stronger every time you use the Moon. I found myself getting motion sickness after playing first person shooter games on my PS3. This is because you can (and will) move your head around; there's no fixed focal point keeping your head steady, like when you're watching tv. It's something to consider if you get car sick or sea sick, but if you don't play games, you'll be fine. The Royole Moon is an innovative piece of technology for video and audio playback in a very small package. It's got many good things going for it, including a great picture with its dual AMOLED screens and high quality audio, but a downside to consider for gamers with motion sickness. I personally enjoyed watching content (in both 2D and 3D) and found the Moon to be highly adjustable and comfortable despite the weight. You can find the Moon available for purchase for $800 at the time of writing.